Can anyone remember Norton and Stockton Accent’s playing in the Teesside Junior Alliance under 16s (I think it was in 1978/79??) Originally the team were called Hutton Road Juniors and played the first few games of the season at Hutton Road, (Middleborough FC nursery club) But changed the name and ground to Norton Stockton Accent’s the same season? They won the TJA under 16s League, Cup and the North Ridding Cup Sat & Sunday (Junior) Can anyone remember the rest of the team and the Manager. Or a picture would be amazing. Norton & Stockton Ancients Juniors started out as Barmoor Juniors with Gary Pallister in the team, the club did not change its name from Norton C.C.T. till 1982, about 1979 the Middlesbrough Priory team folded & they all signed for Norton U14s team with a guy called Wilkinson, a guy called Ernie Petty who was secretary had a photo of the team. Yes I think that they were called Norton Cricket Club and it may have been 1979, It was definitely before Gary Pallister days, Neville Chapman was the manager?? x boro player. Any way what a team it was. I also remember a few guys from Billingham playing for them David Thwaite’s, John Thompson (Big Tomo) And Barry Simpson, Can anyone remember the team? Sorry to say that Charlie (Chuck) McCorkell in this photo has sadly passed away in Australia. Hetton Lyons Cricket Club beat Canada F.C.5-1 in the F.A. Sunday Cup Final last Sunday at the Stadium Of Light, Sunderland. It is the fourth time Hetton have won this trophy, it shows what a good result Stockton Hardwick Social Clubs was & Stockton Sunday League having a club Norton & Stockton Ancients representing the league in this national competition. As well as Len Nicholson in this photo there is another one of the family, young Adam Nicholson, performing very well at centre-back for Hardwick Social & Stockton Town, he also captained the successful Norton & Stockton Ancients youth teams. Hardwick Social knocked Canada (Liverpool) out of the All England F.A.Sunday Cup last week, Hardwick are the present holders. Like Anon I’m very sorry to hear of the sad passing of Tommy Taylor and I’m sure all the Stockton Steel and Teesdale foundry men who look at this site will wish to pass on there sympathy. Sorry to hear of the sad passing of Tommy Taylor, Norton C.C.T. (Norton & Stockton Ancients)longest serving supporter. My brother-in-Law Horace Bishop cycled and raced for Stockton Wheelers with the Taylor brothers. He has 3 of their bikes and at 91 years of age still does his favourite ride to Middleton-one-Row. Tommy is the father of Bob Taylor who played football for Ashmores Juniors and Stockton Shamrocks,he later became a good referee in the North Riding Referees Association.In the early days at the matches Tommy always had a white scottie dog with him and ,you are right Ken, he always rode his bike to and from work – working in a foundry cannot have done him much harm. Tommy Taylor, as Anon states, was a very good moulder at Heads foundries – mainly at Stockton Steel Foundry in Oxbridge. He was one of the top moulders who’s job was to close all the big moulds which was a very precise and important job in the foundry. He was the older brother of the The Taylor Brothers Cycles, makers of very fine racing bikes. Tommy was riding one of his brothers bikes to work up to the time the foundry closed down. If you happen to see him again, Anon, give him my regards. who is about 89 years old & has watched the team since they started in 1959 as Norton C.C.T – over 1000 games and 50 years. Tommy used to work in the Head Wrightson’s Foundry at Thornaby, other keen supporters in the early days were Kit Lawson, a former club cricketer, Joe Gales, John Young & his mate Ken. 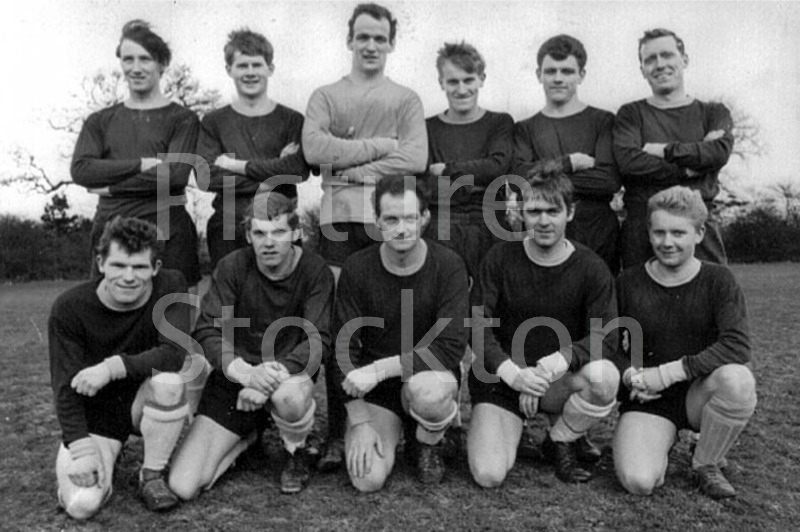 THIS NORTON TEAM WERE KNOCKED OUT OF THE DURHAM MINOR CUP QUARTER FINAL BY SUNDERLAND COLLEGE OF FURTHER EDUCATION 1-0 IN SEASON 1966-67, NORTON THREW THE KITCHEN SINK AT THEM IN THE SECOND HALF, MISSING A PENALTY IN THE CLOSING MINUTES & THE NORTON WINGER TERRY LAING SUSTAINED A BROKEN NOSE. THE SUNDERLAND TEAM BEAT SPARKES 5-2 AT THE BAKERY IN THE SEMI-FINAL. 2-5 before a record crowd of 1,526. NORTON C.C.T. STARTED PLAYING ON A PITCH AT THE TOP OF ASHVILLE AVE & THE BACK OF COUNTISBURY ROAD IN THE EARLY SIXTIES BEFORE MOVING ACROSS TO THEIR EXISTING GROUND AT THE TOP OF WHITFIELD ROAD & THE BACK OF WESTMORLAND GROVE. THE PLAYING SURFACE, WHICH IS A GOOD ONE, OWES A LOT TO THE ORIGINAL GROUNDSMAN, A LITTLE GUY I THINK WAS CALLED GEORGE, SOON AS A MATCH FINISHED HE WOULD LINK THE APPROPIATE ROLLER TO A TRACTOR & ROLL THE PITCH. Good to see the club is doing so well, they reached the last sixteen of the FA Vase on Saturday beating the Liverpool based team Bootle 4-2 at Norton. Now they are away to Derbyshire team New Mill in the next round on Feb 6th. Lenny Nicholson was captain of this team,it was a outlaw turned lawman scenario when he retired from playing & became a referee. CHRIS OLD, THE ENGLAND & YORKSHIRE CRICKETER, PLAYED FOR THIS TEAM AS DID HIS BROTHER MALCOLM WHO PLAYED CRICKET FOR MIDDLESBROUGH. CHRIS WAS A BIG BUSTLING OLD TYPE CENTRE FORWARD & MALCOLM WAS A VERY GOOD WING HALF. ANOTHER BROTHER, ALAN, PLAYED RUGBY UNION FOR ENGLAND. Norton Cricket Club Trust Football Team was formed. In 1959 & joined the Teesside League where they played until becoming founder members of the Northern League 2nd Division in 1982-83 season. Norton never played in the Wearside League, Stockton F.C.did before amalgamating with Norton. Their top honours were winning the Northern League Cup 1982-83 & Durham Challenge Cup runners-up 1983-84.They were always a good cup team,but have never won the two named leagues above.Men who done sterling work for the club in the early days were Barry Lee,Wilf Lawson(Secretary),Billy Russell & Sid Burlison. These guys mentioned above will all be looking down & being proud of themselves at what they started. I played in goal for Norton when the guys above were in charge. During the time I played we won the Durham Minor Cup 1-0 beating Gateshead de la Rue at Spennymoor in 1968. The following season we beat Whinney Banks 2-1 in the North Riding Amateur Cup Final at Head Wrightsons ground in a replay after a 2-2 draw played at Stockton FC ground. These cups were the first trophies won by NCCTFC and also included runners up in the Teesside League. Good times and fond memories. I believe I was the first F.A.qualified coach to coach Norton & Stockton Ancients Juniors(under 13)only one team in the eighties,assisted by Billy Duckling & Ernie Petty(secretary).Billy & Myself turned them into a competitive outfit from one that was getting thrashed every week,we did not take charge till well into the season.There was one member of the team Gary Grounds,he would run from his home in Billingham(in training gear)to Stockton Y.M.C.A.do his boxing training,then run to Norton for football training,then run home,this dedication paid off because he later boxed in the Senior A.B.A.Middleweight Boxing Final.There was a junior team(under 14)played at Norton about 1978 but they were called Barmoor Juniors(after the nearby estate),most notable player was Gary Pallister(ex Man Utd & Middlesbrough). The Evening Gazette hailed Dougie Cattermole as the next Golden Boy(Wilf Mannion)after his performance for Middlesbrough Juniors against Manchester United at Old Trafford in the F.A.Youth Cup 1959,he was a professional with Middlesbrough & Scarborough.Brian Moore the goalkeeper now living in South Africa is the brother of the rugby player John Moore ex Stockton & Hartlepool Rovers. Hello Irene MacLean, I contribute to this site every now and then and couldn”t help noticing your last post. Tell Ian hello from me. He used to live a couple of doors down from me when we were kids on Suffolk St. before he and his family moved to the “posh” area of Fairfield. Not only does my husband know you len-so does my sister and her hubby!Did you live in dover road ragworth-round about number 27? ?My sisters husband is called fred iceton,who I think you know from your footie days-he played for head”s I think.This site is compelling isnt it? ?Irene[ex Dover Road -number 40].Just seen it up for sale. Irene, Sorry I have just noticed this, we lived in 21 Dover Road next to Bells opposite to the road into the two schools. Hope you, Ian, Judith and Fred are all well. Irene Maclean did your husband Ian recognise himself in the Newham Grange Football Team 1954-55,in the Schools section page 5,ref:-t7904. I showed this pic to my husband and he recognised you Len and Dougie Cattermole. He was in your class at Newham Grange, and at the time he was known as “Pud”-Ian Maclean. Now he is known as “Spike”. Hi Bob, how is your Stewy & John Wake give them my Best Regards. I see Ronnie Laverick is now contributing to the site, I have seen Alan Mawby a couple of times recently. The team above is back-row L to R Stewart Evans,John Wake,Brian Moore,Len Nicholson,Stuart White,Charlie McCorkell, front-row L to R Bobby Small, John Muirhead, Lol Carlton, Billy Duckling, Dougie Cattermole. Hi Len, yes a few of the players out here, my brother Stewy, John Wake, and a few more familier faces, Stewy White , Bill Duckling, and of cause EX REF LENNY NICK!!!!!!! HI LENNY COULDN”T FORGET DOUG CATTERMOLE B/R HE WAS MY BEST MAN IN 1965 I”M STILL (HAPPILY)MARRIED,THANKS FOR INFO ON GEORGE OUTHWAITE (USA) I”M NOW IN CONTACT WITH HIM,,CHEERS..